We now have one of the most advanced lasers in the Podiatric Market. The DioWave 10 Laser is a class IV laser and has a dual hand-piece that offers treatments for Surgery and Physical Therapy listed below. The DioWave Laser is currently FDA approved for physical therapy. Fungal toenail therapy has an 83% success rate at a 980 nm wavelength. 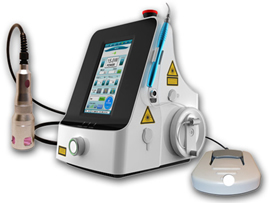 High Dosage Laser Therapy (HDLT) from DiowaveTM offers a powerful new solution for numerous painful conditions previously refractive to traditional medical care. Laser Therapy is a highly effective alternative to traditional therapies such as cortisone injections and many times even surgery for a wide range of problems. In sharp contrast to "Cold Lasers" (LLLT or Low Level Laser Therapy) which provides no feeling or sensation, patients can feel a profound sense of warmth with each DIOWAVE Laser TherapyTM treatment, as it works to provide penetrating laser light energy deep into the body to reach damaged cells and tissues. Results are typically faster than many other therapeutic modalities. Improvement can often be seen after the first or second treatment. Download our laser therapy patient brochure for more information on our DioWave 10 Laser Treatment.